Today I'm linking up with Mar on the Run! et. al. for the Friday Five. Let's dive right in, shall we? 1. Pumpkin Spice: I know it's become so popular that now there's backlash against it, but certain pumpkin spice things still get my attention. And I love pumpkin pie and pumpkin rolls. I really want to try this Cheerios flavor before fall is over. Sorry to disappoint you, Anthony Bourdain. But I draw the line at PSLs. And can we all just acknowledge that pumpkin has almost no flavor and "pumpkin spice" is really just a fancy way of saying "cinnamon and other spices used in pumpkin pie"? 2. Coconut Oil: A few weeks ago a company called Skinny Co. (yeah, another really terrible company name that turned me off a bit) reached out to me to see if I'd want to try and review their coconut oil products. I said yes...but maybe I shouldn't have. Most of the products I received are skincare, and last time I tried coconut oil on my skin, I broke out like crazy. I can try the razor burn moisturizer and the mouthwash (even though I think "pulling" is total bull...along with most of the other supposed benefits of CO). I know it works for some people, but not for me. I did want to try it for my hair and to cook with, but I didn't receive anything along those lines. So I think I'll hand these off to my sister and let her test them out and see what she thinks. The products are really beautiful and smell delicious. The company supports Fair Trade and sustainability, and the oils are 100% CO without fillers. Do they boost metabolism, improve thyroid function, and maintain healthy blood-sugar levels? I don't think the FDA has approved those claims. But it does smell good! 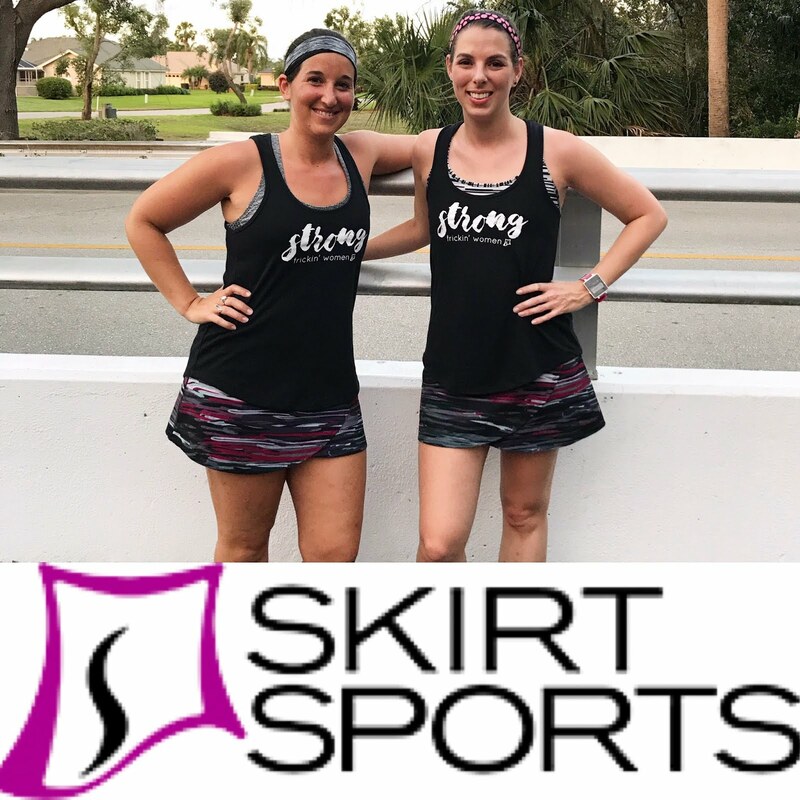 I know some runners like the "our sport is your sport's punishment" mentality, but I've harped on running-as-punishment or running-in-PE multiple times on my blog. No wonder so many people think they hate running! Our first experiences with it are usually negative! It's the same for reading and writing. How many of you have been told to "write a letter apologizing/explaining why what you did was wrong" in school? Or to read silently because you had lost a privilege? It's hard to get creative, I know, but I hate seeing things I love used as punishments! 4. Technology Updates: The new iPhone OS is really a bit busy for me, if I'm being honest. I feel like the entire phone has gone Snapchat crazy. 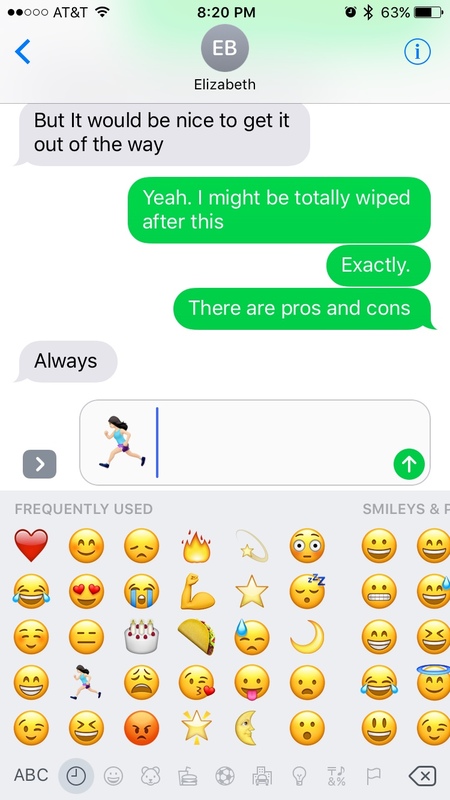 However, I DO love that texting facilitates replacing words with emojis, and that the female runner emoji is finally here! Debating running at 5am for a second day in a row. In other technology news, Pottermore has finally released its Patronus quiz! I'm a proud Ravenclaw and think I was sorted perfectly, and I think my wand matches me really well. 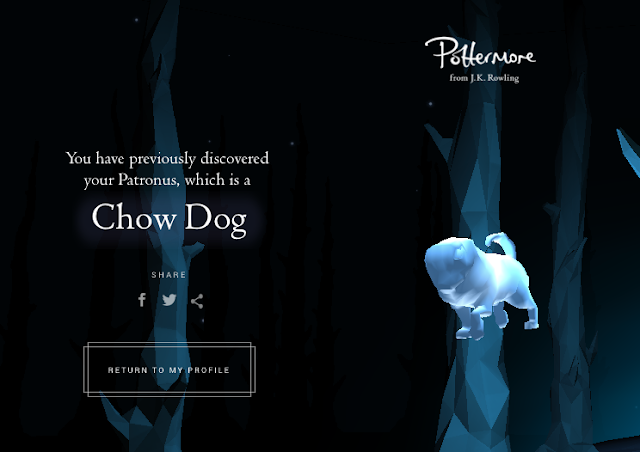 I'm a little disappointed in my Patronus, but the quiz was really cool and - nerd alert - I'm going to research the Chow a little bit to see why it fits me, because I trust PM and its sorting process. 5. Time Management: This seems to be the time of year where things all pile up. Work, workouts, writing, reading, the studio...it's just so hard to divide my time! I feel fulfilled when I'm really busy, but I also feel like I don't have any downtime. 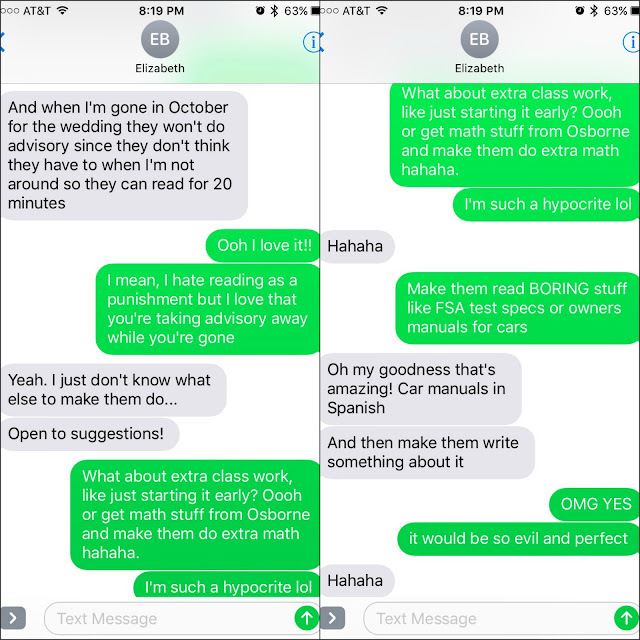 This week, Elizabeth suggested we (along with another friend of ours) have a girl's night and as I was saying, "Yeah, I need girl time!" I realized that actually, I haven't had quality time with Matt in weeks! I actually need husband-time, and usually it's my friendships that suffer when I'm super busy. I need to prioritize and fix that. It's like $10 on Amazon and would easily fit in my running bag! Do you like pumpkin spice flavor? What's your favorite fall flavor? I actually love candy corn because I'm disgusting. Do you use coconut oil for anything? What do you think your Patronus would be? It's not an animal representation of yourself - it's a protective shield made up of your best, happiest memories. How do you prioritize family/friends/alone time when your schedule is packed? I have a box of the pumpkin cheerios in my kitchen but haven't opened them yet. I bought 3 boxes of pumpkin flavored cereals last week! Right now i'm enjoying the pumpkin flavored Life! I don't mind indulging in pumpkin for a few weeks cus I know it won't last long. Mm, I miss Life cereal! I feel like pumpkin works really well in cereal because it's basically like pie crust! Does that logic make sense? I've never had anything Pumpkin Spice flavored so I don't know for certain if I like it or not, but I don't like Pumpkin Pie so I probably don't. I'm in Ravenclaw too :). My Patronus is a Red Squirrel which surprised me a little bit. I'm looking forward to researching it as well, although I think in real life my Patronus would be a cat! After researching the red squirrel, I feel like it fits you really well. And the Chow fits me! Like we said, how could we ever doubt?! I love candy corn too! OMG, so addictive. I think I need to try the cheerios, I have not had cheerios in years! I use to write for entertainment as a kid, but I am not sure kids are wired the same. I just had books and three TV channels growing up- very different from now. AllI've eaten since theyI've had for breakfast since they went gluten free has been Cheerios. I don't know why I love candy corn so much, but it really is addictive! I bought the Pumpkin Spice Cheerios a couple weeks ago and they barely lasted a day. They were SO Good! I don't really get into the pumpkin craze in general. I don't do PSL's. I like my coffee normal. Ooh, now I'm even more excited to find them! I think Target carries them but my usual grocery store doesn't. I like normal (black) coffee, too. No offense, but the pumpkin cheerios look gross!! I just told Meranda that today too lol! I do have students write letters of apology but I look at it as the logical consequence. You do something wrong, you thoughtfully write out an apology, and then move on. I think writing makes them THINK about it more than just saying it really quickly. But I DO get what you're saying. When my classes are acting like animals and not following instructions and are too rowdy, I shut everything down and get out my first day of music class powerpoint. We go over the rules and expectations. It is sooooooooooooooo boring!!!!! But I am like, well, you're not ready to learn, so if you're not ready to learn I'm not teaching you. So I better get you READY to learn so we'll go over my expectations. That is sort of off topic but I wanted to share! LOL...well, I can't take offense because you have different tastes than me. That would be weird. You keep your burned chicken and I'll keep the PS Cheerios lol!! I think writing a letter to apologize isn't necessarily bad. But I've seen teachers have students do like "20 minutes of writing" as punishment and I just think that's arbitrary and teaches them not to like writing. I love that you bring up the first day of school ppt when kids misbehave. I think that's a great way to both deliver consequences (because it's boring) AND remind them of the expectations! I actually like PSLs - I mean, I don't have them that often because most times I'd rather just have regular coffee, but I admit they are a guilty pleasure. Sorry but pumpkin pie makes me gag. No no no. Other pumpkin flavored stuff, I can take it or leave it. But I do love me some pumpkin scented candles! I'm so with you on #5. I just wrote a blog post about fall and I bring this up, too - that this time of year I feel really scattered and can't focus on anything. Work gets busy with events this time of year and there's just so much going on plus feeling like I need to do #AllTheFallThings. I like the busyness to an extent but fall can be stressful too. As for time management, well, I'm bad at that all year long so whatever. I don't mind PSLs but I drink black coffee...when I DO want something fun I prefer chai lattes or something with kick. PSLs have just never seemed worth the money haha. I don't know why fall seems to be busier than summer or winter; maybe it's an evolutionary "get ready for winter" trait haha! I did the Pottermore quiz too! I have to be honest I was a little disappointed when I got mine because it was a Swallow and not an owl...but after reading this description of swallows as power animals I pretty much agree! "You're quite able to soar above any problems and keep your optimism when difficulties and challenges arise." "You're a romantic and devoted partner to your loved one, expressing your affection in a number of creative ways." "You're an intelligent, positive and radiant individual with graceful and quick movements." I think the description is pretty accurate. Maybe the description of yours will surprise you as well! I'd have loved to get a winged animal, but now that I've researched Chows I'm 100% happy with mine! How could I have doubted Pottermore?! They clearly know me so well haha! OmG! I am evil... When my son is not listening at the end of the night, I take away reading because I know how much he enjoys it, and he will get himself together to get his reading privilege back. But I don't believe on giving out punishment to be hurtful. In Mexico if we misbehaved, we had a teacher that would make us write our name 100 times.... not a fun thing to do with long names! and if we got any accents wrong, we would have to do it over. This fall I'm all about apple flavored things! but I will sneak in one PSL. That is one cool patronus! I need to find out mine! I hope you get lots of quality time! I think taking AWAY something kids love as punishment is different than making them do something that should be joyful and making the joyful thing become hated. Kids often seeing reading and writing as "work" and "punishment" instead of something fun! I don't think teachers should support that mentality. I have that tripod....mine came with a little remote that takes the picture....love it! Yes, I saw the ones that come with the remote! I use my watch as a remote so I didn't think the extra few dollars would be worth it for that style haha. OMG I just saw the Pumpkin Cheerios. It's going too far!!! I think they look good! I'm not a huge fan of pumpkin flavor, although pumpkin spice I can handle (because it's not pumpkin :)). I've heard a lot of people say they don't like the new emojis, but I hardly noticed a difference! I guess I don't have a very discerning eye haha. It seems like coconut oil works for certain people, and not others. I usually am very acne prone and the one time I used "oil cleansing" it completely broke me out. Now that I know what works for me, I'm too paranoid to try anything different on my face! Yeah, I'm really leaning toward getting it! 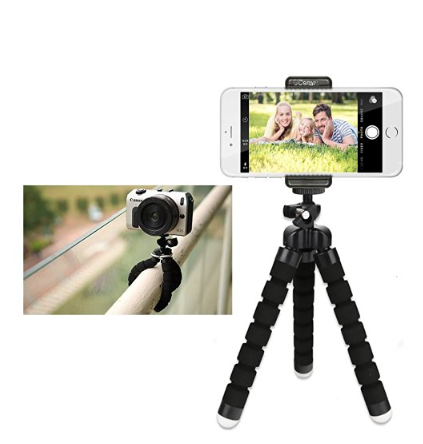 That tripod looks awesome! Does it link to an Amazon referral thing so I can get you credit? No, I don't use affiliate links or referrals or whatever because I'm too lazy to figure out how they work haha! Upriver Ceramics is Up and Running!